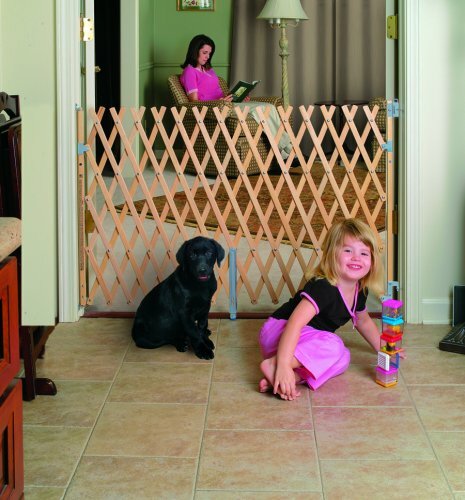 This is a patented gate that guarantees to keep your pets safe and stop them from roaming around the house, especially the rooms you want to limit to them. 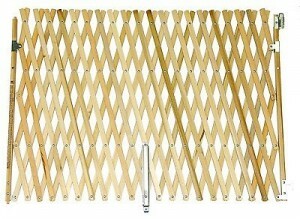 The gate is entirely made from plastic but devoid of any pinch points or choke points. Your pet will be completely safe from any danger from getting hurt by a damaged or broken piece of plastic. The GMI Keepsafe Expansion Gate is extra tall at 33” which does not allow your small pets to jump over the gate, keeping them exactly where you want them. The diamonds between the gate opens to 2½ inches wide and 5 inches in length at the most, wide enough to see through but not so that your pets would escape. When fully extended, the GMI Keepsafe Expansion Gate opens up to 60 inches, making it possible for you to place it on any door way or hallway, or an even bigger area. You can also find 36 inches, 84 inches and even 108 inches versions. The gate is easy to install and only with the help of four #6 Phillips screws and two eyelets, all of which are included with the purchase of the gate. Mounting is easy and should be completed in a matter of minutes by a single person, anywhere and at any time. The GMI Keepsafe Expansion Gate can be opened in two ways to make your journeys to and fro easier. One is when you can open the gate at its hinges at 180 degrees and walk out, and two when you can collapse the gate to move about. The second option is mostly used when you don’t need to keep your gate closed for your pets and want to move about the enclosed space with as less obstruction as possible. When you want the gate to keep closed but you need to use it, an one-hand latching and unlatching option – one that is easy for you but not for your pet – is the perfect way to use this gate. The GMI Keepsafe Expansion Gate can only be opened from one side because the other side is securely attached to the wall. This can be a problem for you in a narrow space, like a hallway. Besides, it is not possible to extend the gate more than the maximum 60 inches by attaching two gates together; 60 inches is the highest you can extend the gate.